There is nothing I love more than a hearty bowl of pasta. 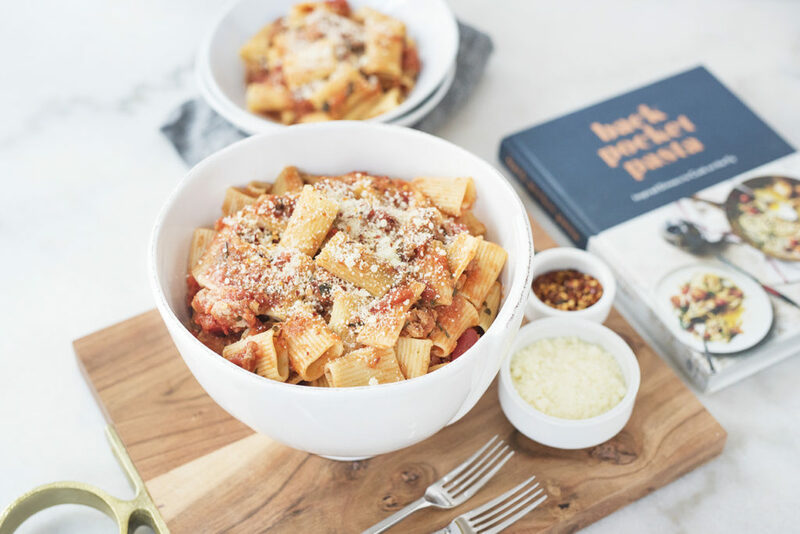 Warm noodles dressed in glossy sauces, topped with parmigiano cheese, and a little crushed red pepper – now that is my kind of meal! 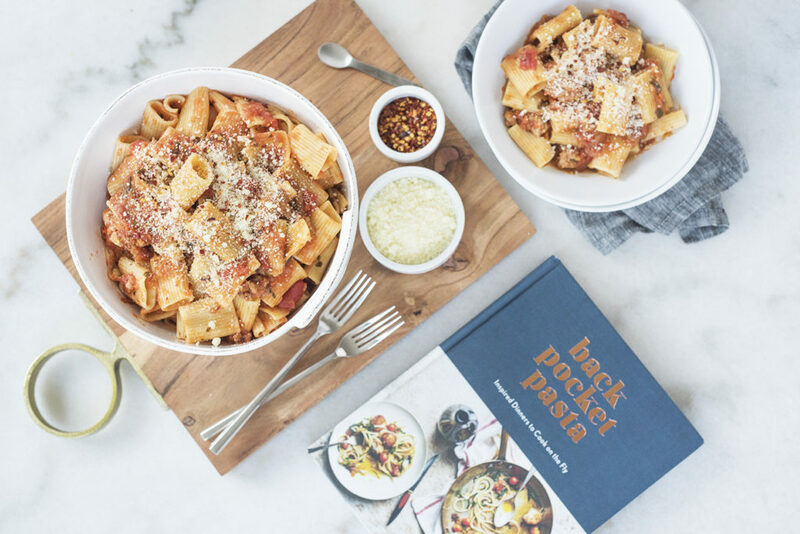 Colu Henry is a wonderful recipe developer that recently released a book called Back Pocket Pasta! Of course I had to get my hands on a copy. Each recipe in the book makes your mouth water and her quick stories about what inspired each recipe was very heart warming. I especially liked her nod to the area I grew up in (Barnegat Bay)! She talked about how her Uncles would get up early to go crabbing off the bay and they would use those fresh crabs in some of their meals. Now that sounds all too familiar. I grew up on 4am trips out to the docks with my family, casting our lines into the water and waiting to feel the little tug of the crab on our string. The moment I opened Colu’s book I couldn’t wait to try out to the recipes. The first recipe I tried was “Quick Sausage Sugo”. The results were delicious and are featured here in the photos below. I definitely have my eye on Colu’s carbonara pasta dish next! If you want to take a peak at Colu’s book yourself, I’d encourage you to swing by Bloomingdale’s TASTE event this Thursday 6/8! Colu has a roster of notable success under her belt, Back Pocket Pasta is just the latest of her achievements. She wasn’t always in food and actually started her career in fashion! Read on below to learn more about Colu and her path to her success. Previously you were working in fashion, how did you make the switch to working in food? Was it hard? I’ve always been passionate about food and fashion, but when I was starting out food PR wasn’t what it is today. It was something that was just taking off. I took a food writing class thinking that was the direction I wanted to head, but learned that I could do PR for chefs and restaurants. It combined a love of both things so I made the leap. It wasn’t hard at all! Do you have a favorite chef that you looked up to in the early days as your inspiration or as a mentor? I’ve had the privilege of working with some of the most incredible chefs in the industry including Scott Conant and Marcus Samuelsson, and peripherally many others through the work of events and partnerships. I listened and learned a lot by watching and asking questions. I also “interned” as a prep cook at our friend’s restaurant Gaskins last summer. Nick Suarez is the chef/owner and he taught me everything I need to know about food storage and staying organized. It’s a valuable lesson for any home cook. You should see my fridge now! How did you end up at Bon Appetit? Did your past experiences contribute to your success at Bon Appetit and if so, in what ways? I was fortunate to work at BA right as they re-launched the magazine in 2011. It was an exciting time to be a part of food culture, which the magazine produces so well. They were supportive of the hashtag #backpocketpasta and that gave me the confidence to move forward with expanding the idea into a book. 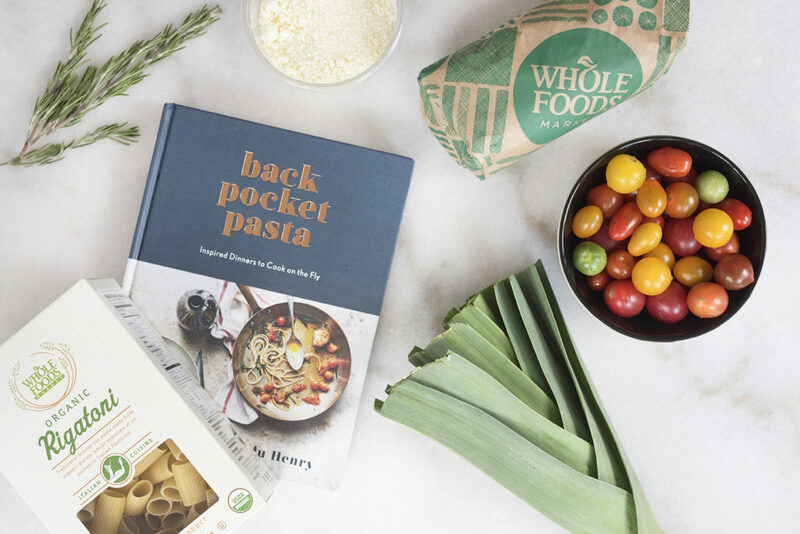 How did you come up with the concept for your new book Back Pocket Pasta? The book started as a hashtag on Instagram, but was born out of the way I was cooking when I got home from work. I was tired and didn’t feel like shopping or creating complicated meals. 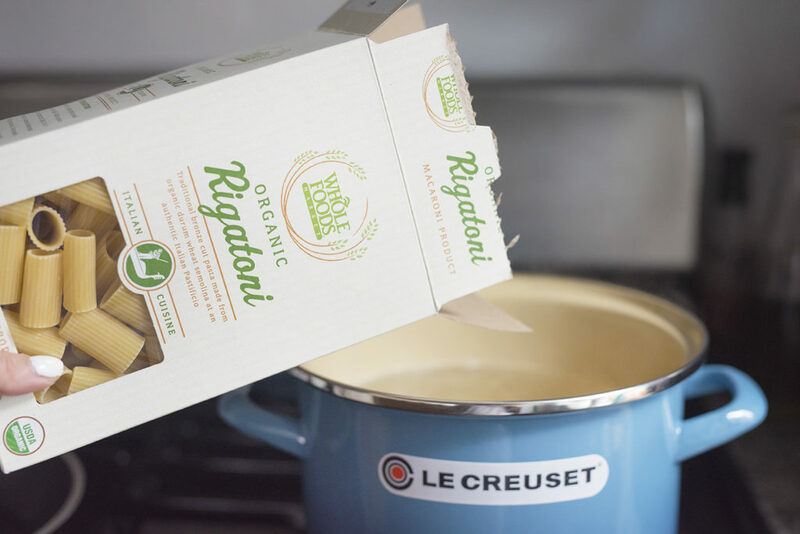 I looked around my cupboards and started to pull together simple meals with what I had on-hand. I keep my pantry well stocked and shop seasonally so it came naturally to me. Many stars aligned and I was lucky to be offered the opportunity to write a cookbook about it and encourage others to do the same. From start to finish, how long was the process for creating your book? What was the most challenging aspect? The whole process took 2 ½ years from ideation, to proposal, to finished product. Writing a cookbook (or any other book, I’m sure) can feel very isolating. It’s you and a computer for countless hours. I’m a very social person, so staying focused and just being with myself was challenging at times. Do you have any advice for all the aspiring cookbook writers out there? Make sure you’re writing about something you truly love, because once you’ve made the choice, there is no turning back. I love pasta more than any other food and it was still hard! If you were hosting a dinner party for friends and family, what would be on your ideal menu? Fried chicken and lots of rosé! 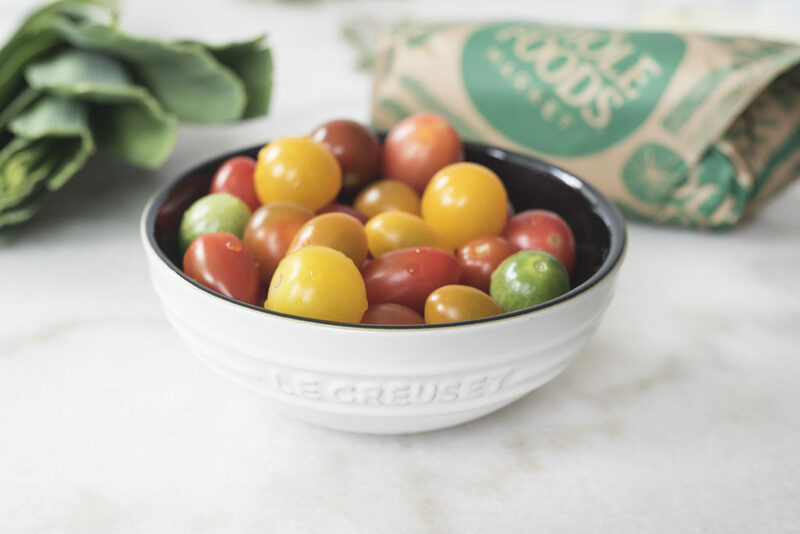 Don’t forget to register for the TASTE event at Bloomingdale’s this Thursday 6/8 where Colu will be whipping up weeknight-friendly pasta dishes. After trying out the recipes in her book, I know this is an event I don’t want to miss. Can’t wait to try some of Colu’s cooking first hand! This event is brought to you by @wholefoodsnyc, @taste, @lecreuset, @bloomingdales & @coluhenry!